Yes, it’s still colder in Ullswater…. You can try pausing to admire the beautiful morning, the misty view as the lake snakes its glimmering way up to Pooley Bridge at the other end, the tranquillity of the scene, the lovely unspoilt Cumbrian fells… sooner or later you are going to have to get all the way in. And this is Ullswater, where it is always colder. Drawing inspired by a swim when I was up there the week before last, at Glencoyne Bay with Francine, Rosie and Margaret. There may have been a little bit of squealing, but if there was, there was nobody else around to hear it. 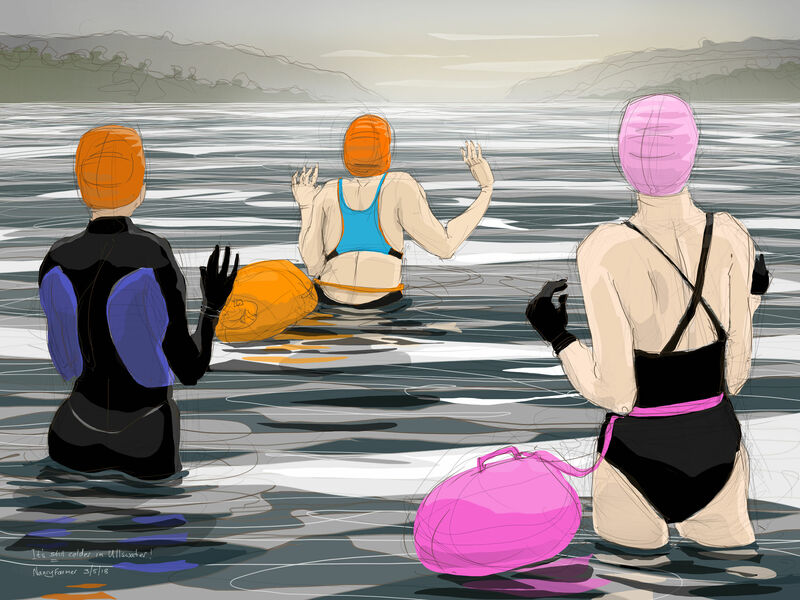 This entry was posted in digital, showcase, swimming and tagged art, Cumbria, drawing, lake swimming, open water swimming, swimmers, Ullswater, winter swimming on May 3, 2018 by Nancy Farmer.